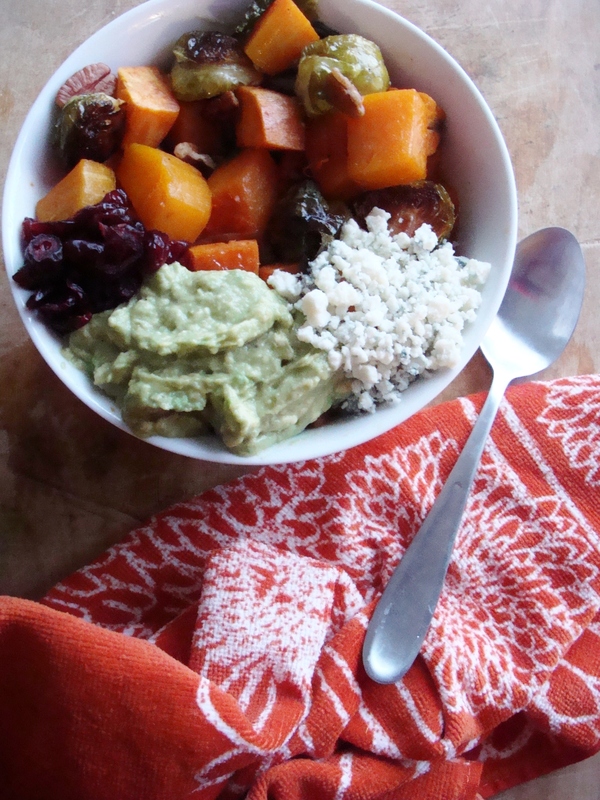 roasted harvest veggie bowls with sweet avocado. Folks, I have the cure to your “post-Thanksgiving I ate too much” blues. These bowls are super filling and super savory–plus you get to eat CHEESE and eat your veggies, too. 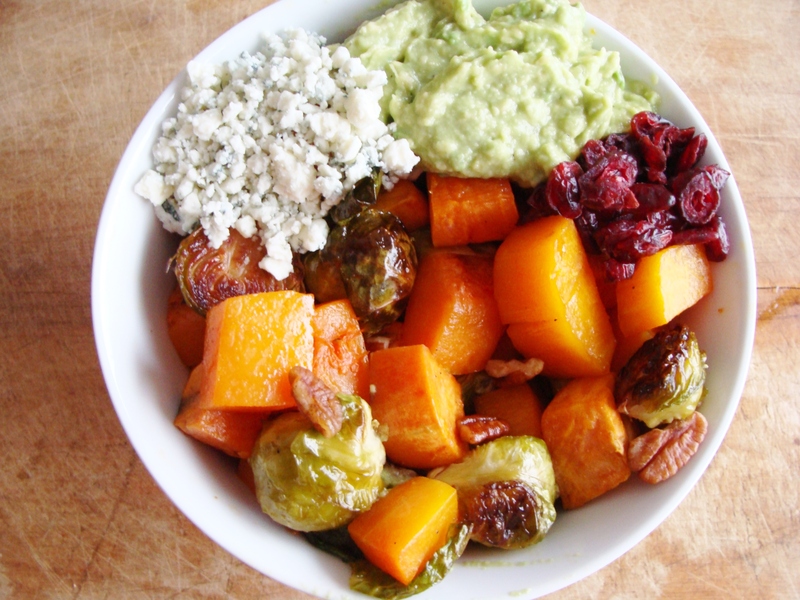 Roasted harvest veggies–butternut squash, yams, Brussels sprouts–combine with mashed honeyed avocado, dried cranberries, chopped pecans, and bleu cheese. I made this for the first time a few weeks ago and thought how perfect it’d be for the week after Thanksgiving. So much color! Comfort food, but also good for you food! Prep your veggies for roasting. Peel and chop your yams into 1-inch cubes. Remove the stems from your Brussels sprouts and slice each sprout in half. Peel your butternut squash, remove the seeds, and chop into 1-inch cubes. In a small bowl, mix your olive oil, maple syrup, cayenne pepper, and a sprinkling of sea salt and black pepper. Whisk until blended. Spread your chopped vegetables out in a single layer on a non-stick baking sheet. 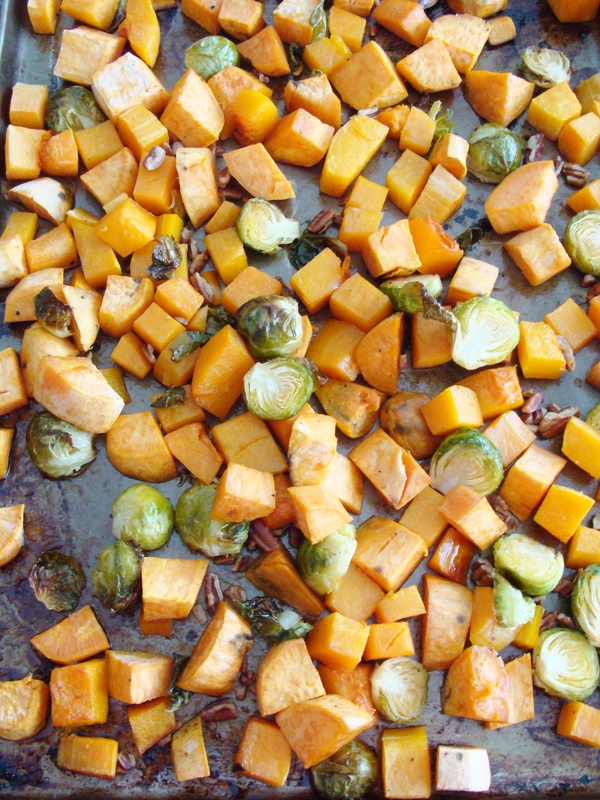 Drizzle the olive oil/maple syrup mixture over the vegetables, then toss them to coat. Roast for 45 minutes – check on them halfway through and turn them over. When there is 15 minutes left of cook time, add your chopped pecans. While veggies are roasting, make your sweet avocado mash. Peel and scoop out the avocados, and mash in a small bowl. Add your lime juice, honey, and a pinch of sea salt and black pepper. Mix well. Add more honey if you’d like it to be sweeter. 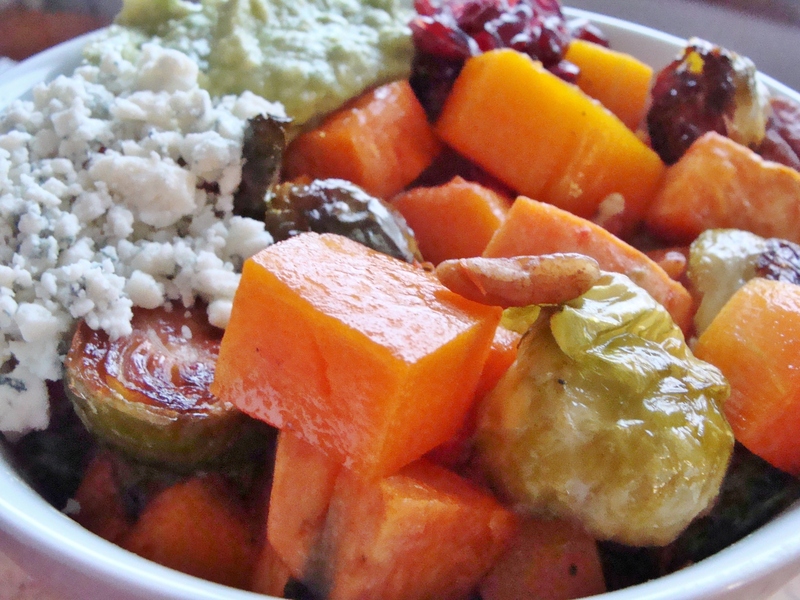 Put a generous spoonful of veggies in a bowl to serve. Add a dollop of sweet avocado, a spoonful of bleu cheese, and a handful of dried cranberries. I am a steadfast lover of bleu cheese, but if you’re not, you could swap feta or goat cheese and it’d be just as tasty. This is deceptively addicting. Luckily it’s a pretty healthy food obsession to have. § 2 Responses to roasted harvest veggie bowls with sweet avocado. Yum! A delicious dish that I can eat a ton of and not feel guilty – great idea! « baked pasta with Italian sausage, kale, and red pepper. 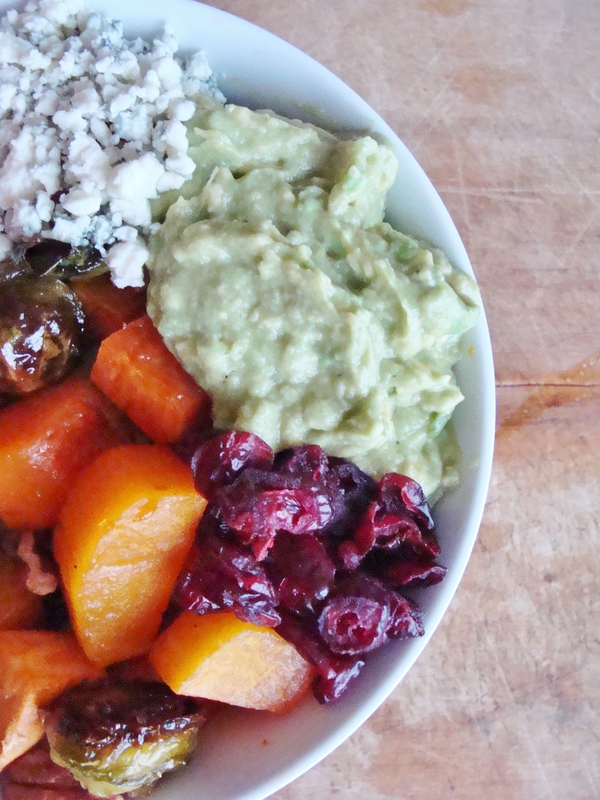 You are currently reading roasted harvest veggie bowls with sweet avocado. at The Cheesy Kitchen.